The arches at Pacific Science Center turned purple for the University of Washington’s Paws-On Science weekend. More than 2,800 people visited the galleries and exhibit halls of Pacific Science Center during the three-day event. 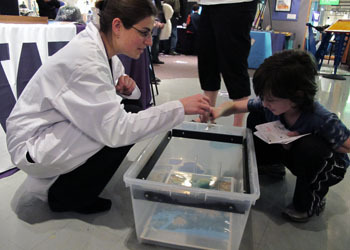 Local families came together for activities, games, and demonstrations all designed to explain the world-class research and achievements of scientists at the UW. Three aspects of JISAO’s research were featured including climate change, tsunamis, and underwater volcanoes. JISAO was represented by Assistant State Climatologist Karin Bumbaco, Climate Impacts Group researcher Guillaume Mauger, as well as JISAO scientists Mick Spillane, Joe Resing, and Nathan Buck. On the first day of the event, Karin Bumbaco and Guillaume Mauger displayed an activity encouraging guests to think about the best places in Washington to place rain gauges. Visitors could place miniature rain gauges in a box over a waterproof map of Washington State while discussing potential strategies for designing a rain collecting network. They covered the box with plexiglass drilled with holes in sizes that match the amount of precipitation received in each region of the state. People then got to test their network by making it rain over the state using a plastic watering can. Bumbaco also displayed an experiment with black beans representing year-to-year precipitation totals to show the difference between weather and climate. The activity allowed visitors to compare precipitation averages between Seattle and New York City with surprising results – New York City gets a lot more precipitation than Seattle! Meanwhile, Mauger used wooden puzzle pieces to represent the different components that go into climate modeling. Visitors assembled the puzzle and ran a mock climate model which lead to a discussion of the forecasted climate change impacts for Washington. Mick Spillane demonstrated tsunami detection and forecasting on Saturday. Spillane is one of 18 JISAO scientists working at the NOAA Center for Tsunami Research, a program that successfully combines real-time data with numerical tsunami models to provide reliable warnings to people threatened by tsunamis. His display was based on a diorama in which families could create waves, see a scale model of a tsunami detector, and watch computer-based animations illustrating tsunami generation and forecasting methods. Following the recent tragic events in Samoa and Chile, most visitors to the display understood the necessity and benefits of the tsunami program. Several people had visited Hawaii and had seen firsthand the precautions being taken there. On Sunday, Joe Resing and Nathan Buck were on hand to discuss the discovery of the deepest undersea erupting volcano ever seen. In May 2009, Resing lead a team of scientists who captured high definition video footage of the West Mata volcano 4,000 feet below the surface of the Pacific Ocean. Resing showed guests video of glowing red vents ejecting lava into the sea, bursting molten lava bubbles, and the first-observed advance of lava flows across the deep-ocean floor. Footage of the eruption was first released in December 2009 at American Geophysical Union’s annual fall meeting in San Francisco. Pacific Science Center received rave reviews about each of the exhibits and is proud of the event’s success at enhancing the public’s understanding of the phenomenal research being done at the University of Washington. Bumbaco and Mauger’s exhibits were created as part of Pacific Science Center’s Science Communication Fellowship program.